Although Ferapontovo is not far from the river route between Moscow and St. Petersburg, its monastery is not included in the cruise schedules. Perhaps that is just as well, for the small monastery could easily be overwhelmed by large groups. Yet the significance of its sublime frescoes is open to all who would appreciate these works of art. 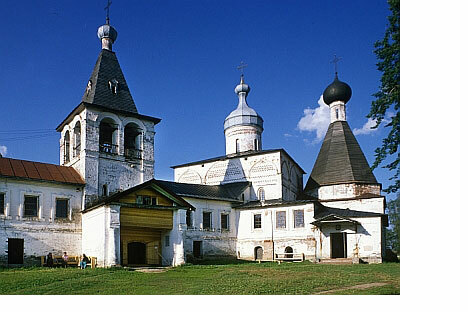 The monastery was established in 1398 on the shores of the Lake Borodava. Its founder, Ferapont (1337-1426), was a monk of noble birth from Moscow's Simonov Monastery. He was canonized in the sixteenth century, and the northern monastery that he founded came to be known as Ferapontov, although it retained its original dedication to the Nativity of the Virgin. The entrance to the monastery is through a picturesque gate that supports two small churches dedicated to the Epiphany and St. Ferapont (1649). The center of the monastery is the Cathedral of the Nativity of the Virgin, rebuilt in brick in 1490. The upper walls and cupola of the Nativity Cathedral were substantially modified, starting in the sixteenth century with work continuing through the eighteenth century. The main entrance to the cathedral is flanked by frescoes devoted to the Nativity of the Virgin. They serve as an introduction to the work of one of medieval Russia's greatest artists, Dionisy, who painted the interior of the Nativity Cathedral in 1502 with the assistance of his two sons. The fact that such a renowned artist, accustomed to commissions for frescoes and icons from the court of Grand Prince Ivan III, should engage in work far to the north is further evidence of the close relations between these monasteries and Moscow. The frescoes, in praise of the Virgin Mary and Christ, are extraordinary in the warmth of their colors and the delicacy of the figures. Due to the remote location and small size of Ferapontov Monastery, these frescoes did not undergo the repaintings typical of many medieval Russian churches and are well preserved, despite modifications to the structure itself. On a bright day, the compact space of the cathedral is suffused with vibrant color. The Ferapontov frescoes are now on the UNESCO World Heritage list. In addition to the Nativity Cathedral, the main ensemble of the monastery includes the refectory Church of the Annunciation (1530-31) and the Church of St. Martinian (1640), which features a tower roof. The ensemble is linked on the west by a raised gallery with a 17th-century belltower. One of the great charms of Ferapontov Monastery is its natural setting, surrounded by lakes and forests that convey the haunting beauty of the Russian north. There is no clearer evidence that despite their asceticism, the pioneering monks who came to this region had a superb aesthetic sense. Ferapontovo is a little off the beaten path and visitors will probably want to be based in Vologda, which is accessible by overnight train from either Moscow or St. Petersburg. To reach Ferapontovo from Vologda, take an early bus heading to Lipin Bor, Petrozavodsk or Vytegra and get off at the Ferapontovo turnoff. The bus ride takes around 2.5 hours and will cost around 120 rubles. The monastery is a two kilometer walk from the village. You can also take a taxi from Volodga to Ferapontovo. A taxi for the trip and around two hours waiting time will run between 2,000 and 3,000 rubles.